Giving The Gift Of A Moment: Collaboration with Own A Moment* INCLUDES DISCOUNT CODE! Love is in the air and the big v-day is coming up pretty soon. In celebration, I’m bringing you 5 v-day themed posts in the next 5 days at 5pm, starting with this one! I always struggle with what to get my partner for this day as we agree not to get each other gifts that are too lavish, but, after 6 years, my ideas for small and thoughtful gifts are running out! Own A Moment give a gift like non-other; the gift of an actual moment. I recently discovered this company through twitter, and they agreed to send me their product in exchange for review! So, here goes..
Own a Moment give a gift that is better than being timeless, it’s the gift of time itself. Through this company, you can pay to own an actual little snippet of time that is recorded in the Official Time Registry. They pride themselves on this gift being 100% original, as well as being handmade in the UK by the lovely Martin, and they ensure 100% no duplicates. This means that once you buy someone a moment, it will be theirs forever! No one else can ever buy that moment as it is officially registered as yours, pretty special right? I decided to use my moment to give the gift of a moment to Zack. I chose the moment (or near enough) that he actually asked me to be his girlfriend, as I thought that this would be such a special gift that he can treasure forever! I am so so so happy with how this turned out! I had to present it to Zack a little early because of this blog post, but he loved it nonetheless, and he’d never heard of a gift like it before. 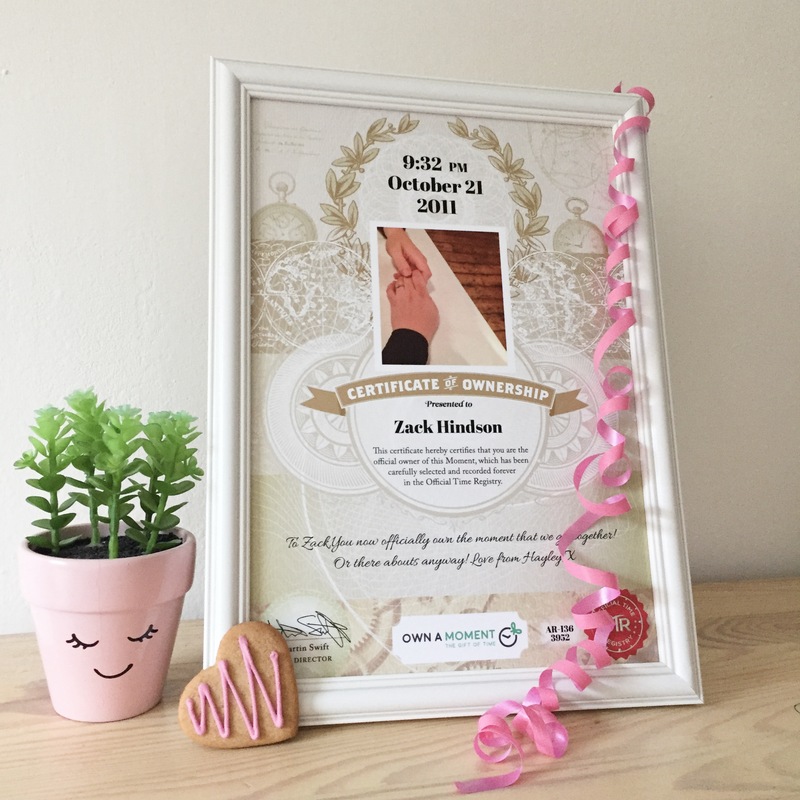 As well as getting it recorded in the Official Time Registry, you also get a certificate to present to the person whom you’re gifting it to. I chose to have mine framed in this simple white frame, and I think it looks really lovely! Other options include a digital download (so that you can print it yourself), printed without a frame, or printed with a silver metal frame, an antique oak frame or a dark walnut frame. You can also add a photograph to the certificate which I thought was a really lovely touch! I chose a simple photo of us holding hands whilst celebrating our 6th anniversary this year. As well as personalising the certificate with who you’re presenting it to, you can also add a little message of your own! This would be the perfect, unique v-day gift, as well as being suitable for so many other occasions! 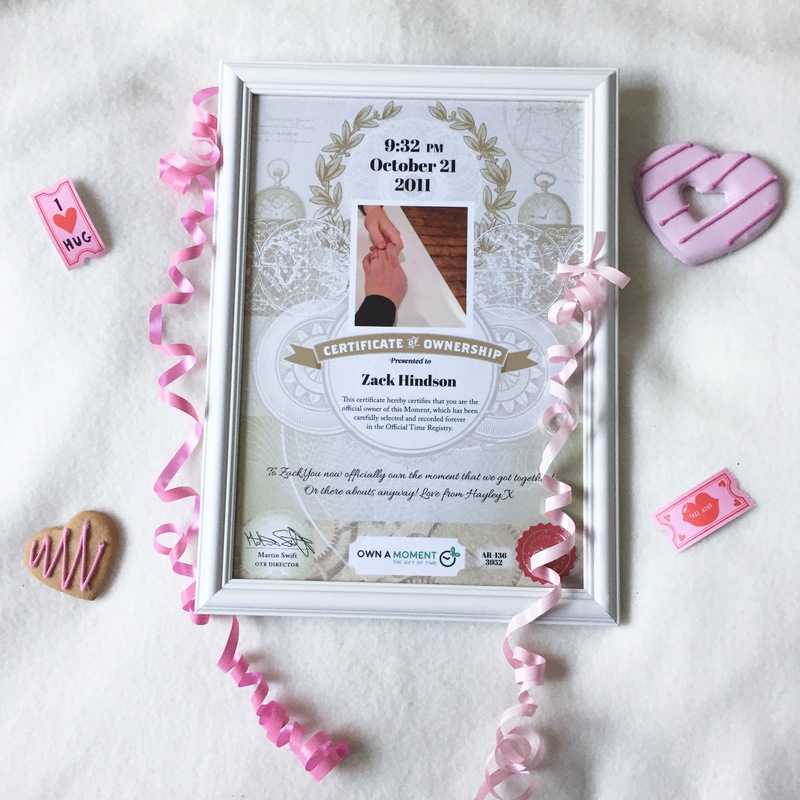 Why not give the gift of a moment for a wedding gift, or to celebrate a new baby? I think this gift is such a lovely way to present someone with a moment that you will treasure forever; I only wish I had heard about the company sooner! Want 50% off your Valentine’s Day order? Use code ‘HEART’ at the checkout! *This product was sent in exchange for review. For more information, please see my disclaimer. What a unique gift this is and it’s perfect as a Valentine’s gift. Previous Post Bloggers Made Me Buy It: Take Two!